Finding the right items for your holiday promotions and giveaways can be difficult. The winter season brings with it the holidays, and businesses will be celebrating in some ways. 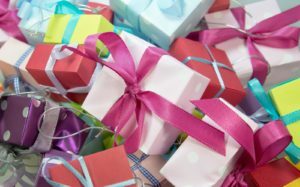 Between parties and holiday giveaways, you may be looking for the right items to hand out to your employees, clients, or potential customers. Finding the right items for your holiday promotions and giveaways can be difficult. After all, what kinds of promotional items make great holiday gifts? What kinds of items will your employees or potential customers use on a regular basis? Here are five promotional items you should consider for your upcoming holiday giveaways. Metal sports bottles are eco-friendly, on-trend, and great for everyday use. Plus, they’re easily branded and will keep beverages at a consistent temperature no matter the weather conditions. Reusable water bottles are extremely useful, and outfitted with your company’s logo, will make great holiday giveaway items. A wireless phone charger makes a great holiday gift. This useful little device is easy to store and can be conveniently placed on any desk or countertop in your office or home for easy use. Many of these wireless chargers feature a clean surface on top where your devices charge, which provides a great surface for your promotional design. Tote bags are always in demand for all sorts of shopping or storage needs. These trendy, eco-friendly bags will often bear a design or promotional logo, so be sure to print your promotional tote bags for your holiday events and giveaways. Not only should you be thinking about the right promotional materials for your holiday giveaways, but also the upcoming new year. This means choosing trendy items that will be appealing to current and potential customers. Campfire style mugs are easily customizable while also providing an on-trend vibe. Show your business has its finger on the pulse by designing campfire mugs for your giveaway items. An excellent item for customization and giveaways is the wireless speaker. Employees and customers can make use of these indoors, outdoors, at home, or with friends. They are a fun gift for holiday giveaways, useful, and trendy, making them a great promotional material to consider this upcoming holiday season. This entry was posted on Friday, December 7th, 2018 at 12:57 pm. Both comments and pings are currently closed.